Word has it that it'll run 0-60 miles per hour (97 km/h) in just 3.4 seconds, while 0-100mph takes 6.4 seconds. Aston Martin has finally taken the wraps off the new DBS Superleggera, which replaces the Vanquish S. The Gaydon-based automaker describes the new model as "a Super GT that's a breed apart". So to celebrate the new DBS Superleggera - the company's replacement for the Vanquish S - we thought it worth a trawl through the DB bloodline's rather pretty history. The muscular exterior has been entirely sculpted using carbon fibre. 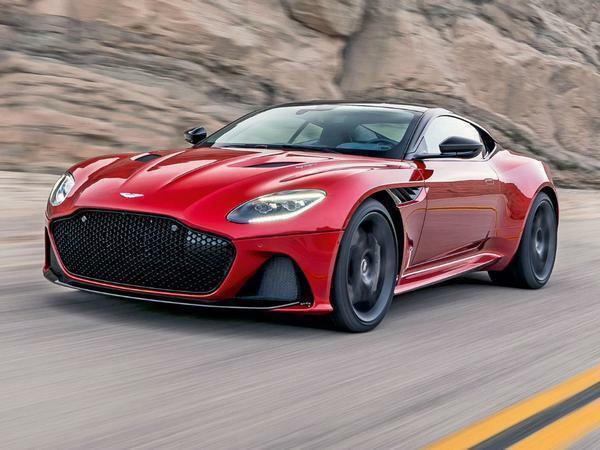 Aston Martin President and CEO Andy Palmer said in a statement that the DBS Superleggera "signals our return to the very pinnacle of the Super GT sector". Power from the V12 is pushed to the rear wheels courtesy of a ZF eight-speed automatic transmission. As you can see, it has mostly fresh bodywork - rendered nearly entirely in carbon fiber to help cut a good 160 pounds (72 kg) off the curb weight, now down to a reported 3,733 lbs ( 1,700 kg). Nobody builds "bird cage" vehicle bodies on separate chassis any more but the new DBS lives up to its Superleggera nameplate by combining an evolution of the latest generation lightweight bonded aluminium structure first seen on the DB11, featuring forged double wishbones in front and a sophisticated multi-link system at the rear, with carbon-fibre body panels for a dry weight of 1693kg - 72 kilograms lighter than the DB11. It gets forged double wishbones at the front and a multi-link system at the rear. The DB11 chassis has been further developed, with new-generation adaptive damping and a choice of three modes for both powertrain and suspension: GT, Sport and Sport Plus. The headlights are LED units which incorporate a daytime running light and a lock/unlock graphic. This particular example comes finished in a Satin Jet Black finish - part of the optional Q color palette - with matching 21-inch twin-spoke wheels, red brake calipers, and a black Alcantara interior. They cover carbon ceramic dice measuring 410 mm in diameter and 360 mm at the rear. While most of the elements seen here are optional, the DBS Superleggera won't come from the factory with limited features. Carbon fibre inlays and seat back veneers can be optioned in carbon fibre. As usual, there's the Mercedes-Benz Comand-derived infotainment system as standard, using a freestanding centre display and a rotary controller. For audio, there is DAB plus Bluetooth, phone streaming, iPod, iPhone and USB playback. There is also an integrated sat nav and wi-fi hub, which is all controlled on the central LCD screen and dial. The Aston Martin DBS Superleggera will start at $517,000 plus on road costs and be available either late Q4 2018 or early Q1 2019.